This is almost like the real thing but not anything close to it yet. 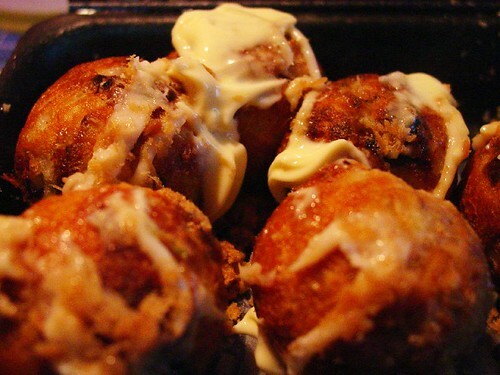 It is definitely a step further from your regular Samurai Balls, but not anything close to the real takoyaki. Found beside the Market!Market! Metro Gaisano’s grocery, Kuya Chito’s Takoyaki attempts to sell a Filipinized version of Takoyaki. It was a brave attempt, but not quite like it. Wry!? Where did Kuya Chito’s path to Takoyaki fail? It was the empty airy inside and the rubbery almost gummy consistency outside. The gummy texture may have been due to the fact that the Takoyaki was overcooked. It was deep brown when we bought it, which was definitely strange for takoyaki (unless it’s brown due to the Tonkatsu sauce glaze). The inside was airy that it was like biting through a deflated baloon. I think they forget to pour some more of the batter after placing the vegetables. Or maybe there’s too much vegetables in it that there’s no more space for the flour. I am assuming that this Takoyaki stall is still at its earliest stages. One wherein they don’t know if they are cooking it right or not and they’re still studying which combination is done right. Meh. Major meh. Fine, I do have a fault of eating it a little cold. But that’s no excuse. I’ve asked my mom to bring home some of Ngee Ann City’s Takopotchi. 3 hours after it was bought, the outside may not have been crispy anymore, but it wasn’t gummy and it still had a creamy inside. I’ve also brought home that elusive Takoyaki from that discreet Takoyaki stall in that shady grocery at the end of EDSA extension and it was far from gummy. So with those flavors as basis, I know this Takoyaki isn’t doing something right. It’s quite unfortunate that I wasn’t there to buy it myself. I’ve seen the stall before but never bought one because I was in a rush. My mom just brought these home last night in hopes that I no longer need to keep on requesting her to get me those damn tasty Takoyakis from Ngee Ann City. But to our disappointment, these takoyakis were a failure. I must say though that despite the texture, the takoyaki was still flavorful. From what you can taste on the inside, it still had that nice gooey almost cheesy flavor. They also topped it with some mayo (not a lot though, I had to add kewpie) and instead of katsuoboshi, they used something like pork floss. Word of caution though, if you buy it in the stall and eat it right away, they will pour this hideous Chilli Sweet and Sour like sauce. ><;; Not good. Just stick with the mayo and the pork floss and you’ll be fine.